grand stream dreams: Weird XP Folder Issue--Solved! This isn't what I was planning to post, but it was really fascinating troubleshooting adventure. A few days ago I posted a reference to a little "tweaking" application that lets you modify the standard "commonly used" icon list that pops up when you are selecting a folder to browse or save to: PlacesBar Editor It's a handy little tool and is very clever. So there I am, tweaking my list using the application. Everything was working fine. I decided I didn't like the plain-vanilla folder icons on the two folders I'm adding (Downloads and Claus's Stuff). So I changed the folder icons to display a little snazzier icon selection. Fine so far. Then I save the changes, only the icon for the "Claus's Stuff" folder didn't show changed after all. Hmmm. OK. So I go into Windows Explorer to change the icon for the folder again, but now I don't have the option to change it! And, XP is showing me two "General" tabs for the folder properties! Weird! I try several times to change it, but the system refuses to let me modify it. Also, instead of reporting the folder as a "File Folder" XP is telling me that it is a "Folder" while viewing the contents list in Windows Explorer detail/list view. Next, I created a new "Claus's Stuff New" folder and copied the "Claus's Stuff" folder contents into it, and then tried to delete the original "Claus's Stuff" folder. It wouldn't let me, even under command-line. So XP was clearly treating this "Claus's Stuff" folder as a special System folder of some kind. Looking under the two "General" tabs again, it clearly was treating it as a "My Documents" folder, even though it wasn't. How about that! But my "My Documents" folder was just fine (the "Claus's Stuff" folder being just a sub-folder of that folder). OK. I rebooted into Safe Mode to delete that corrupted folder now that I have a safe copy of it. Only I have a USB keyboard and I just now learned that my BIOS doesn't pick it up until AFTER the OS boots. Bummer. I tried my Bart's PE CD but same problem, I have it set to request a key press to boot the CD and if the keyboard doesn't work.....Luckily I had a PS2 keyboard I could dig out of the closet. Handy Tip: Keep a PS2 keyboard (or USB to PS2 adapter) on standby just in case if you use USB keyboards! Once "safely" in Safe Mode, I logged in as Administrator, deleted the weird folder "Claus's Stuff" folder and renamed the copy I made from "Claus's Stuff New" back to "Claus's Stuff". I rebooted and swapped PS2 and USB keyboards back. OK! Success! 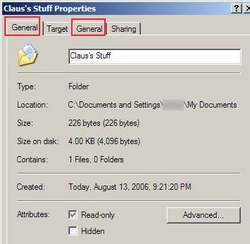 The new "Claus's Stuff" folder was now listed as a "File Folder" again under Windows Explorer! Hurray! I went in to check the properties, yep, the tabs were back to normal and the second "General" tab was gone! Bam! 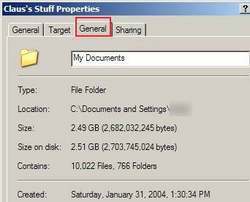 XP's Windows Explorer again reported the "Claus's Stuff" folder as being listed as a "Folder" and a quick check of the properties found the two "General" tabs back. The folder originated from when I copied my "My Documents" folder over from my Win98 system. Instead of just copying the contents, I just copied the folder and then renamed it "Claus's Stuff" as a subfolder of my XP profile's "My Documents" folder. Maybe that had something to do with it. But in my first steps, I had created an entirely new folder and just copied the contents. Was my registry messed up? Why did it keep associating this folder as being a "My Documents" system folder? Hmmm. Think. The folder name might have something to do with it, but I didn't really think so. I renamed the file "olddesktop.ini" and then refreshed the folder. A quick check of the folder properties showed it went back to "File Folder" status and back to one "General" tab! Because I had copied the contents of a former "My Documents" folder, I had picked up that desktop.ini file as well. The custom settings in that file caused it to identify the folder as a "My Documents" System folder, even though it clearly wasn't. That's why changing the folder itself and it's name didn't end up having any effect. I was still copying the file causing the mess along with the good stuff! InfoTip=Stores your documents, graphics, and other files. "File system folders are commonly displayed with a standard icon and set of properties, which specify, for instance, whether or not the folder is shared. You can customize the appearance and behavior of an individual folder in two ways: Create a Desktop.ini file for the folder, or Create a Folder.htt template for the folder." 1) Keep a PS2 keyboard handy if you have a USB keyboard and when copying folders. 2) Make sure you don't copy the desktop.ini file over unless you just really want to!